Harakat al-Shabaab al-Mujahideen, more commonly known as Al-Shabaab (meaning youth), is a clan-based jihadist terrorist group in East Africa. Originating as the militant youth wing of the Somali Council of Islamic Courts (ICU), which took over southern Somalia in June 2006, the group splintered off following the defeat of the Council in December 2006 to continue violent insurgency against the Somali Transitional Government and its allies in Ethiopia and Kenya. 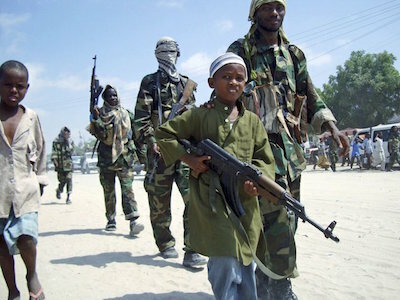 It is the largest militant group, numbering around 7,000, fighting to overthrow the Somalian government and aims to control territory within Somalia in order to establish a society based upon rigid interpretations of Sharia Law. Al-Shabaab’s unity, however, has been affected by numerous internal conflicts due to the fractured nature of the organization, competing clan loyalties, and debates between nationalist goals and the goals of Gulf-based transnational terror. Al-Shabaab’s goals include promoting local insurrection, establishment of a fundamentalist Muslim society, and eventual regional and global jihad under Wahhabism and Salafi Jihadism, extreme Sunni ideologies that count among its adherents other jihadist groups such as Al-Qaeda. To highlight this relationship, Al-Shabaab was founded by Somali extremists educated in the Middle East with tutelage and support from Osama Bin Laden. In fact, many members of Al-Shabaab’s leadership got their start fighting along Bin Laden in Afghanistan during the 1990s. Returning home to a Somalia which had no effective government, Al-Shabaab’s leaders such as Ahmed Abdi Godane, who held the top post of the terrorist organization until his death by U.S. drone strike in September 2014, sought to establish a local political and religious system in accordance with their Salafist beliefs. The ICU briefly gained control of Mogadishu, the Somali capital, in December 2006 until they were driven out by a coalition of Somalian and Ethiopian troops. Following that defeat Al-Shabaab initiated guerilla assaults, suicide bombings, and assassinations against Somalian and Ethiopian targets while increasing ties to Al-Qaeda and clans in southern and central Somalia. By January 2009, Ethiopian troops had withdrawn from Somalia according to their UN-backed agreement, allowing Al-Shabaab to declare victory and retake Mogadishu, though by then they had lost some of their popular support. Al-Shabaab instituted its own governing structures, providing social services and collecting taxes. They also became one of the first jihadist groups to recruit heavily through Twitter and other social media, engaging disaffected first and second generation Somalian youth living in the United States, the United Kingdom, and Canada. Al-Shabaab surrendered control of Mogadishu to a Transitional Somali government backed militarily by the African Union in 2011. In February 2012, they formally pledged their allegiance to Al-Qaeda and received additional support. Despite this, their area of control has steadily shrunk while internal conflicts have led to purges and splits. To regain prominence, Al-Shabaab began to focus on high-profile attacks in Somalia and neighboring nations including the Westgate Mall attack in Nairobi, Kenya in September 2013, that killed 67 people, resulted in a multi-day siege, and captured global media attention. In April 2015, Al-Shabaab launched an attack on Garissa College in Kenya that killed 187 people, most of whom were non-Muslim students. "AL-SHABAAB" Counter Terrorism Guide, National Counterterrorism Center, http://www.nctc.gov/site/groups/al_shabaab.html; "Al Shabaab," Mapping Militant Organizations, Stanford University, http://web.stanford.edu/group/mappingmilitants/cgi-bin/groups/view/61; Jonathan Masters and Mohammed Aly Sergie, "Al-Shabab," CFR Backgrounders, Council on Foreign Relations, http://www.cfr.org/somalia/al-shabab/p18650. Backgrounders, Council on Foreign Relations, http://www.cfr.org/somalia/al-shabab/p18650.